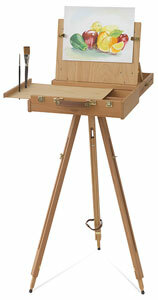 Here's the perfect set for your plein air painting! 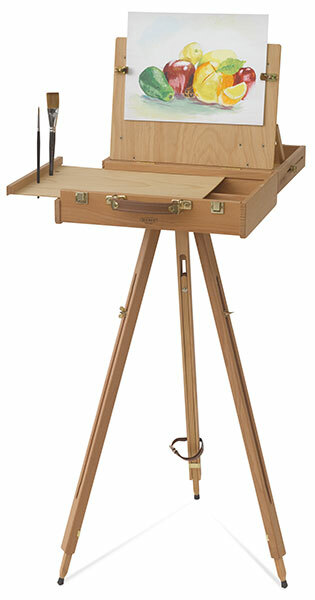 Mabef Tripod — Crafted of oiled beechwood and complements the Mabef Pochade Box. The tripod adjusts from 27½" to 45½" (70 cm × 116 cm) high. The legs fold and can be held together with the included leather strap. Mabef Pochade Box — Crafted of oiled beechwood and features a sliding 13" × 16" (33 cm × 41 cm) palette with holes for five brushes. Sliding supports hold canvas panels up to 9" × 12" (23 cm × 30 cm) in place while painting. Three compartments allow for storage of paints, brushes, and accessories. The overall dimensions for the box measures 5"H × 16"W × 12½"D (13 cm × 41 cm × 32 cm). A threaded fitting on the bottom of the box accommodates the matching adjustable tripod.